Everything in soft focus tonight: the rain past, puddle-warm sidewalks and the gray pink afterglow still swirling. I am drinking in this time with her, storing it away for autumn: sunlight gathered in the green canopies of summer trees. It is too much and not enough. I want to remember everything, keep each moment still, like resin (a dandelion puff frozen in a crystalline shell). I want night to fall, the hush of hours almost my own. I want morning to come–the brightness of her eyes, a sudden smile, her gaze sharpening as the darting form of her sister, doe-like, skitters through the room. There is a bald patch on the downy back of her head. Even this I will myself to remember. It passes slowly, moves too quickly. It rained heavily today for a few hours. 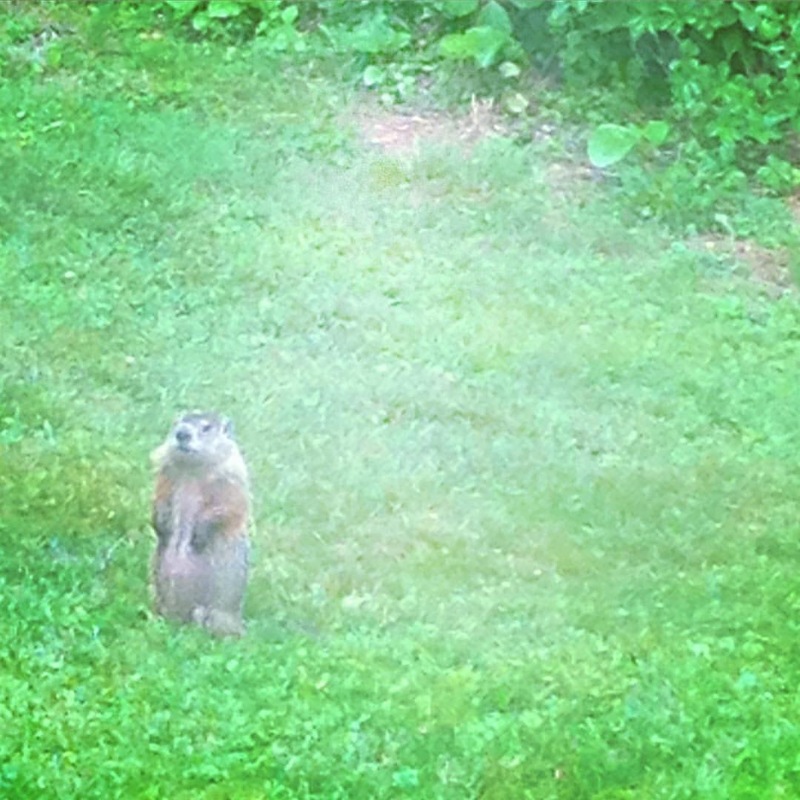 I watched the baby groundhog that always seems to be outside my bedroom window; there were two today, before the rain, though only one of them noticed when the window frame creaked as I leaned on it–cocked its head and looked towards the house, thinking and seeing who knows what. Last year, a previous generation of small, flexible groundhogs descended on my vegetable garden–just when the crowns of broccoli were starting to emerge, the rows of radishes showing their heart-shaped leaves in perfect rows. I never managed to fence them out; only when I caught them once, scampering and squeezing out of the bed as I came around, did I see how they had managed to fit beneath the fences and through the netting. Their (larger, rounder) mother joined them in the backyard; I’ll never have the heart to clean up the tangle of stones and shrubbery that seems to house them in the wildest corner of our lot. Another time, from the same bedroom window, we watched a spotted doe try to nurse from its mother as she stood, grazing. She kicked it with one of her rear legs. I’m never completely happy with these little fragments of writing–and it feels odd to send them out into the world with that ambivalence. But isn’t that what we’re always trying to help our students do–to out the words down, get them out, and send them on their way before the self-doubt pulls them back? Revision, yes, but first, just words. She was sure that the corn makes a sound as it grows in the field: just as I am sure that I can hear the boxwoods shrugging and stretching their leaves in the cool evening hours of spring. Whether it is merely a vestige of so many Midwestern years or a concrete memory, perhaps of some Pennsylvania summer day (knee high by the Fourth of July), I can also hear–and even feel–the sound a cornfield makes. Even just the memory of a cornfield vibrates, radiating noisy, impatient greening. The last time we walked through Aunt Eleanor’s house. I remember the cornfield there, where I walked. I bent my head and gathered something from the grooved dirt between the rows. A coin; a shard of glass. Something meaningless. But I remember it. It seems strange to me that I will probably never live in the Midwest again. Never say never in academia, of course, but I think that we are settled here(ish), and although one of my daughters is, like me, a rare Colorado native–a coincidence of time and space that stitches together the disparate geographies of my family–my younger daughter is a native New Yorker (the state and not the city). That again is a sort of coincidence, as we could have driven to the New Jersey hospital where my husband was born in half the time it took us to navigate the mountains, the bridge, the Hudson, the haunches of deer flashing bright in the headlights. But are you from where you are born? Where you lived first? Last? Longest? I don’t think I’ll ever feel like I’m from New York, no matter how long I live here. I’ll always feel like I am from somewhere emptier, flatter–even if I don’t know precisely where that is. 384 miles from my door in Madison to the house in Missouri that was also once home; I still remember that odometer count. How different those miles were from the miles I drive here. And maybe it is the memory of those miles–and of miles across Kansas, Illinois, Indiana, and Ohio, the states that have been, for decades, permanently between–that leaves me standing on a porch in suburban New York, comparing the sound of boxwood leaves to the noise a cornfield makes. I am at a loss for words today. Can I still come here if the words don’t come? I think this is why I feel that the writing I do here is important to my work–as a teacher of writing, it helps to be reminded of the paralyzing blankness of an empty page. It all has to start somewhere; for years, my format here has begun with an image. Why have I never thought of that before as a writing exercise that I could teach? I have taught brief captioning exercises using Instagram, which is close, I suppose, but that was really a task of brevity. This kind of writing is associative, meandering–starting in a place where something matters, but you’re not sure why–and trying to get there somehow, to approach the meaning that was suggesting itself to you. Rocking back and forth in the glider, I’m trying to type this in another stolen moment. I haven’t gotten to the meaning; it’s hovering somewhere just out of reach. I’ve been taking lots of headless selfies lately; the subject is not me and not quite her but us, these days of closeness–closeness that is exhausting and exhilarating, endless and yet ephemeral. She will not always be here, like this, but it feels like she always has been here, like this. How fast it all changes and yet how slow it goes sometimes, in the hours of rocking, nursing, needing–always needing. But such beauty; such tender beauty and such sadness at the swiftness of it. I keep thinking of the seasons, committing to memory the flowers that were in bloom and the trees that were in leaf when she came, when she smiled, when I saw the world reflected in her pale blue irises. The magnolia burst into waxy, exuberant bloom somewhere between the first and last (fourth) time we drove to the hospital; the blooms collapsed under unseasonable snow the day before we brought her home. The azaleas were pink and white in the first weeks of her life, viewed mostly through the bedroom window as we slept the days away in fits and starts. The alliums I nearly missed–purple spines fading to green by the time I paused to look. I forced myself to watch the peonies, to savor them; for some reason it was hard to do so, hard to look away from her and linger outside as the tight-wrapped buds unwound into drooping, silky blush. Ever since the first of my babies was born, nearly three years ago, I’ve struggled with the idea of writing in this space as I used to. Part of that stems from the obvious adjustment that one, and now two, babies means in terms of time. The only reason that I can type this now is that my toddler is not home and my baby is sleeping—on me, as a matter of fact; she is wrapped across my torso, snoozing as I write at the standing desk in our living room (a wise choice; I never knew how well this arrangement would lend itself to babywriting/babywearing/babywritingwearing). The other reason I don’t write as much is that, well, I don’t write as much. It’s no longer a requirement of my profession; when I was in graduate school, I wrote here frequently in order to keep myself writing frequently elsewhere. 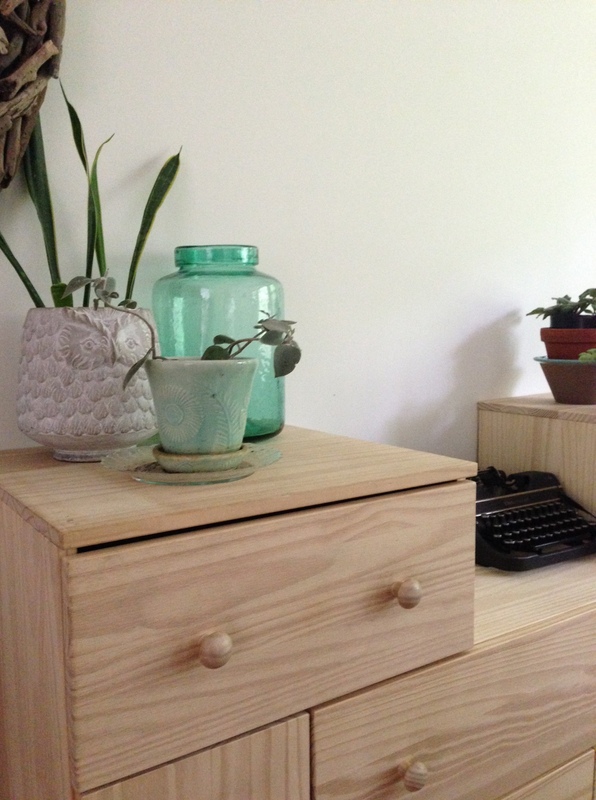 The words that I typed here made it easier for me to type the other words that I needed to write, and my blogging and my work wove themselves together over the years, converging in my affection for plants, dinosaurs, and miscellaneous household objects. My job now is to teach, and primarily to teach writing, and it would be good, I think, if I wrote as much as I think and talk and organize and administer on and in things relating to writing. But it’s hard to write about your job, even if your job is about writing, especially when you’re in the first part of the tenure track. There have been many things I’ve wanted to write here about my three years (and counting) as a community college English professor, a job that I love and that I find challenging in ways that are mostly very fulfilling, but it’s been hard for me to find the words that seem appropriate to my new position. I’ve been teaching for a decade, but the last three years have moved me to a different position, and my public writing has not followed me so easily. Yesterday, though, as my newborn was sobbing inconsolably in her carseat as I drove my station wagon back to my large suburban ranch home (how do these things come to pass? ), I had an odd moment of writerly inspiration, something that has not happened to me in more than a passing moment during the last three years of my frantic adjustment to professionalism and parenthood. I spent the day with an old friend of mine (how lucky I am to count multiple poets in my acquaintance) and I think that seeing her shook loose some of the cobwebs; whatever it was, I suddenly wanted to write. And of course I didn’t get to, in that moment—nursing and diapers and piles of tiny, dirty pastel clothing were there first, when I got home—but it visited me again this afternoon, as I was walking in my garden (a wreck of weeds and determined, still-lovely peonies). 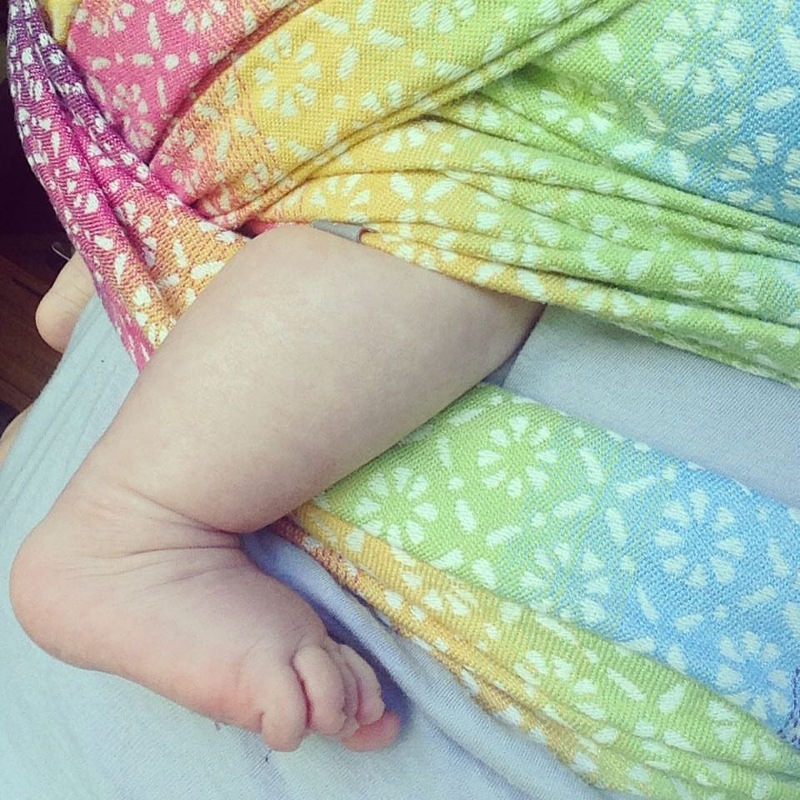 It’s so odd, but the thing that’s been inspiring me to write is this—a woven wrap with windmills on it, with which I wrap and carry my daughter. She’s right here now, bound to my chest in a choreography of twists and knots I learned though watching youtube videos. 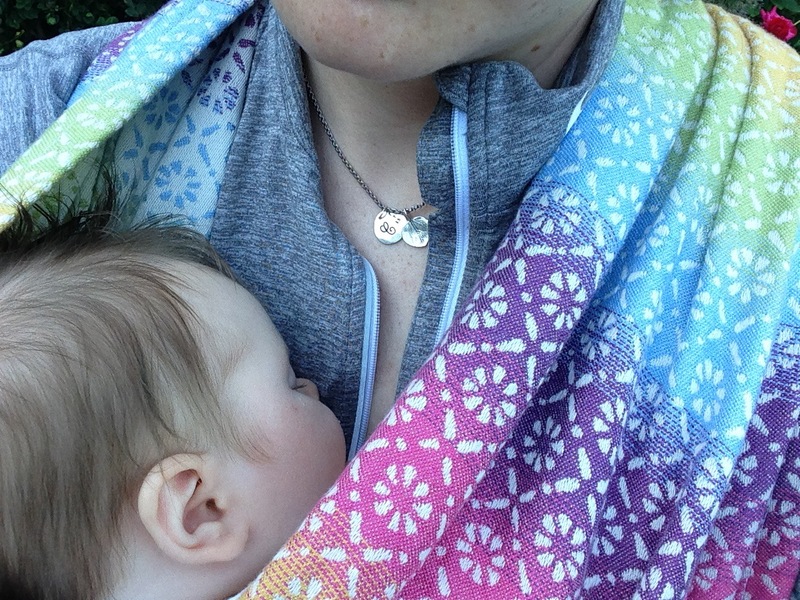 I own several wraps now, all purchased second (and often third or fourth) hand through exchanges orchestrated on the many babywearing facebook groups I now belong to (again, how does this happen? 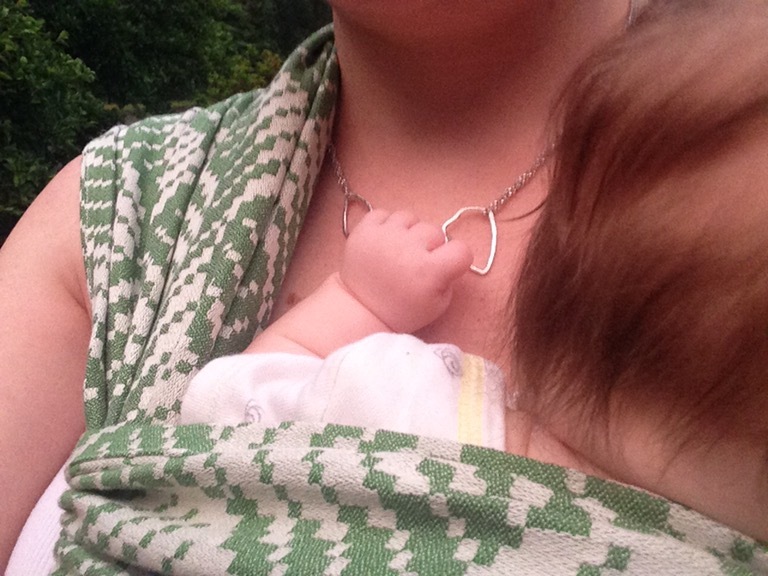 ); online spaces where parents discuss and trade the ephemera of babywearing. I’m not quite sure that “ephemera” is the right word here, but then again, it may be just right; time with babies is always moving with such unaccountable swiftness (though the individual days and nights can often seem interminably long). So, on one of these groups, I wrote a post about what I was feeling about this wrap. Windmills, of all things. I don’t know why I love this; but of course I know why I love this, standing, writing, her heart beating against mine. I never could have imagined. And yet here I am, back again and writing in the same place that I used to write before any of this came to pass. I haven’t posted many pictures of my house (this house, at least) in a while. It’s been hard to catch a moment during the day, for one thing; and photographs at night all look a little spooky, no matter how well-lit. And then there’s my perfectionism: everything has been moving around the house for the past 18 months we’ve lived here. The rooms keep changing function, and the furniture moves in a circuit between the garage, the two living rooms, the dining room (in which we never dine) and the bedrooms, which range in size from extravagant to miniature. This room, the front living room, is huge (in sort of a bowling-alley fashion) and bright, thanks to the large bay window (let’s just not talk about how that window fares when faced with massive amounts of melting snow). I have discovered, at least, that fiddle leaf figs thrive in this light; for a while, the room was primarily furnished with three large fig trees and a white couch (I am my mother). If I could, I would tweak a few things in this picture. I would have made sure that you could see the other pine shelf, which intersects with the one you can see at a right angle (it’s shorter, and where I keep my laptop and useless old books). I would have made that monitor go away (to say nothing of its tangled cords). Darwin, I think, could stay. But then this picture, and this post, never would have happened. So here it is. 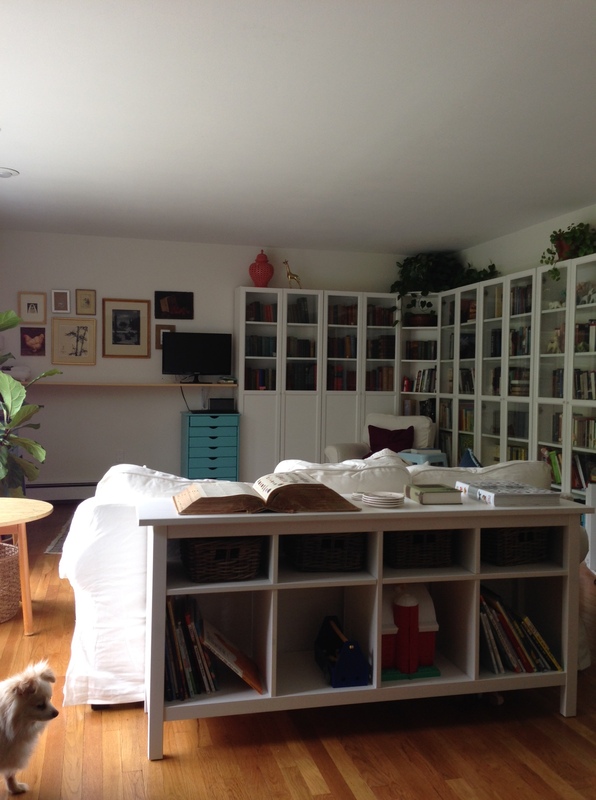 We recreated the shelving situation that we had in Colorado, which I love (Ikea Billy shelves with glass doors). I especially like the corner here; we didn’t have one last time. The walls are cut up here by baseboard heat that we can’t block, so the bookcases had to form an L. We were left with the mirror-image L (on the left side of the photo), which has baseboard heat at the bottom. Ricky, inspired by the internet and by our Hartford friends K and J, wanted to make a standing desk. I will admit to skepticism and an impractical preference for antiques; I didn’t want things to get too “Ikea.” (I am fond enough of Ikea, but only when counterbalanced with some creaky, old, impractical things with delicate finishes that pose barriers to ordinary use.) So we installed two boards above the heaters; one at counter height (my preference), which you can’t see here (huge fig tree in the way) and one at standing height, for Ricky. It seems almost like something out of Alice and Wonderland. I can’t help my irrational attraction to its pill-like feet and random drawers. Mine is missing one drawer pull (a small price to pay for saving $300 and, more importantly, not having to put it together), but I have a ceramic turtle knob around here somewhere that would be just the thing. I’ve also managed to create here a standing desk for CMW, who happily smashes along on the Underwood. I figure that it’s lived through many decades already, and is unlikely to be done in by one solitary toddler (famous last words). 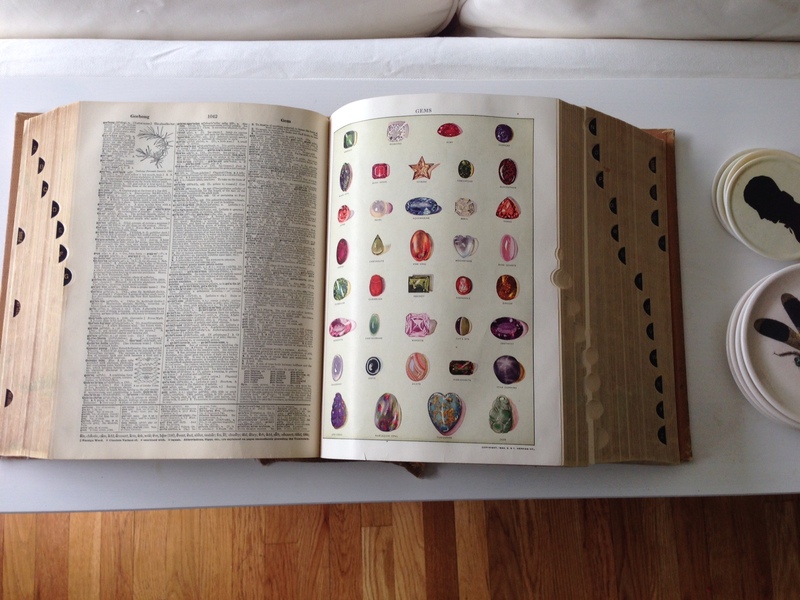 Moving the white cabinet behind the couch also allowed me to open this old dictionary to my favorite page, which I remember studying as a child—long before (but perhaps why) I read The Moonstone or saw the gem collections at the Victoria and Albert and the Smithsonian. The dictionary lived, open to random pages, on a book stand in the houses I grew up in; my dad has similar memories of its presence in his childhood homes. He brought it to me last year, wrapped tightly in over-sized plastic wrap from Costco and nestled inside his allotment of checked baggage.